A Nepalese immigrant became the latest embodiment of the oft repeated “American Dream” success story. 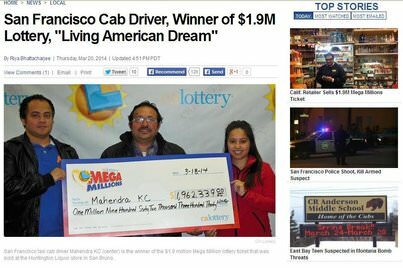 Taxi driver Mahendra KC, who had always dreamed of winning the lottery since he came over 10 years ago, won a $1.9 million Mega Millions prize Tuesday night. Mahendra had bought the $1 quick pick ticket from the Huntington Liquor Store in San Bruno. That dollar provided a return on investment of more than $1.9 million when five of its numbers matched those drawn Tuesday. Had Mahendra’s ticket managed to match the mega number, he would have won a much larger pot. The Mega Millions jackpot last Tuesday was $414 million. Initial plans for the money include paying for medical treatments for KC and his parents, and paying off his children’s student loans.